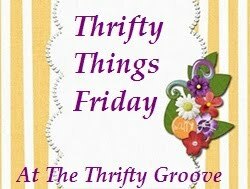 The Thrifty Groove: The First “Thrifty Things Friday’! The First “Thrifty Things Friday’! Woohoo, I am SO excited about today! Welcome to my very first linky party here at The Thrifty Groove! I want to do a quick Thank You to my friend Linda at A La Carte for passing the torch to me! Thank you “Soon-to-be-as-in-any-minute-now” Grandma Linda! Besides this being my first linky party, today is April Fool’s Day! And for me, that means it is my wedding anniversary! Yup, Troy and I were married on April 1, 2000 in Las Vegas Baby! We flew about 50 friends and family to join us for a fun filled Vegas wedding weekend! It was a blast! Happy Anniversary Sweetheart! Okay, ready to see some Thrifty Things? Of course you are! Why else would you be here? I am going to go all wild and crazy today for our first Thrifty Things Friday and show you some brand spankin’ new, from a retail store, thrift things! What??!! "No 2nd hand cool thrifty finds?” Nope “No pictures of more of the treasures from the infamous $1.00 auction boxes?” Nope! Sometimes it is actually cheaper….er…thriftier to find bargains at regular retail stores. I went thrifting at one of my absolutely favorite stores, Christmas Tree Shops! My first cute find I thought would be perfect for a Spring time table runner on the coffee table in the living room. Isn’t that just the sweetest fabric! I grabbed this from the first cart I saw when I walked into the store. Seriously, would you have passed this up?! I got 4 other ones that I plan to use the fabric in a different way. The sign had said 75% off but, these were even cheaper that that! Now, if you are not fortunate enough to live by one of these stores, I thought I would just show you a couple of quick glimpses around. Okay, on to more thrifty treasures. If you have read my blog, you know I love to play with tablescaping. And when you do that, you want lots of pretty linens. Well, here are some quilted placemats. Now, you may be thinking, “Um, yes those are pretty but where is the thrifty part in all these placemats?” Let me show you…..
Are we loving the numbers “2 & 8” or what! They had a huge display with all these pretty different placemats. All of them were .28 cents each! I could NOT walk past this display and not help myself to 2 or 3 or 12!! This display was filled with all of these placemats and they all are just a bit “irregular”. Not exactly the same size or perhaps when sewing, some threads got bunched up in the back. You know the kind of things I am talking about. For the most part, that is just fine by me for this price! Next up are these really cute quilted lunch bags. Aren’t those adorable~! They have a plastic liner inside. And the thrifty part of this is? Okay, so it is not a “2” but, I still think .48 cents is a steal! Here are just a couple of the dollar items that I thought were cute. This is a little cardboard treat stand. It will hold your decorated Easter eggs or mini cupcakes. These are just the cutest little bunny socks! I couldn’t resist! Now I know a lot of you are sitting there staring at your screens thinking, “Well, it must be nice to have one of these stores around. But, I don’t!” And because I know that, I decided that my thrifty things should be YOUR thrifty things!! That’s right! To celebrate this very first Thrifty Things Friday party, I have put together 2 little giveaway packages of these fun thrifty items. Since there will be two winners, I have made up two different packages. The first name selected by Random.org will get to choose first. You will choose from the “Pink Set” or the “Blue Set”. Yay! Is that fun? I hope you think so because I had a really fun time picking out these things for you! Okay, before we get into the details of the giveaway, I am going to fill you in on the “rules” of this party. *Write a post on your blog about something “thrifty” that you want to share. Links will be removed if they don’t have a link or button for Thrifty Things Friday. *And although not mandatory, I sure would appreciate if you left a comment! Phew! That part is done! Now on to the giveaway! *There will be two winners. The winners will be chosen through Random.org. *This is open to ALL of my readers, regardless of what country! That’s it! 9 entries possible! Okay, now I can’t wait to see what you all have to show today!! Happy Anniversary to you and Troy! I would like to be entered into your giveaway! Congrats on your first party:) We don't have this store here, but I did see where we are getting one about 3 hours away and I will be checking it out...I'm real excited about it!!! Those little lunch bags are just soooo cute. I'm a happy follower:) Please count me in. You know I love the Christmas Tree Shop. I am going to have to run up to mine and see if there is any clearance because the last time I was there, there wasn't any. Yes, i want to be entered and Congrats on the new party!! Okay, You know I am a follower! I have the party button on my side bar # 3. I hope I am doing this right?? Did I get this right??? it would be all Christmas goodies! Great finds! I'm entering your giveaway! Thanks! What a awesome store, many pretty things in there! A fantastic giveaway, count me please! Wow, you found some great deals! I am a follower! I linked up to the party...thanks! I placed the party button on my sidebar! Linked up to party #1 ! Linked up to party #2 ! Linked up to party #3! Linked up to party #4! Thanks so much for hosting the Linky party. I just found your blog. I've never seen a Christmas Tree Shop before! At 28 cents, you could use the placemats once and then toss! ;) Thank you for being the new hostess! Enter me please! Because of your other post about the Christmas Tree shop I went and checked it out. What a fun place to shop. We got a few unique things for a very thrifty price. What a wonderful store. I've never heard of it and I've never seen bargains like that. I thought I did good at Hamricks today with 80% off their winter clothes. I love it all. Thanks for the giveaway. Diann, Christmas Tree Shops look awesome. We don't have them in our area. I think I'm a pretty good thrifter, though...I do not, however, have you beat! You're the champion! Diann, I don't understand linking up to party #1, 2, 3, 4 -- this seems to be one party? I have never heard of the Christmas Tree Shops! What great bargains you find! I don't know how anyone could pass up something for .28! That's just about free! I linked to your party. Thanks for hosting! I am now a follower and would love to be entered into your giveaway. Thanks for hosting and I have linked to your party. No need to remind me it is April Fool's Day - SNOW is again in the forecast. What a trick. I do have one question though - how are you able to get such good "in the store" shots? No hesitation at all? You don't feel a little intrusive? Not that you should but I always feel a little weird about taking pictures in shops. Is this something I just need to get over? Hello Diann, I'm gladly joining your link party. Thank you for hosting it. Hi Diann...I am one of your newest Followers! Thanks for taking over the Friday par-tay. I thought I was too late but saw you were still accepting entries so I'm in! Hurray! Like you, I LOVE the Christmas Tree Shops. Wonderful store. and, I was amazed...so many lovely thrifty pieces you got...i fancy those dishes, mugs and teapots(?). woot woot!!! I'm a brand spankin new follower! And signed up for the email too....WOOT! I love Christmas Tree Shops! I almost never went in because I honestly thought they only sold Christmasy things. Very happy to see how wrong I was! Now I need to go back to see if there are any cool buys like the ones you got. Great going! I would love to be entered in the contest. Thank you! Wow what great deals you found! I am your newest follower! I also have a "thrifty thursdays" party each week and would love for you to join in! I added your button to my linky party page too! WOWIEE! What a store! Wish we had one here. So soweet of you to put together a giveaway. Count me in! Thanks for dropping by -- you always find such fun things! I found my way over here from Blessing the Elements blog. Be still my heart--thrifty and finding amazing bargains! What cool finds you snatched up--wish there was a store around here like that. Following your blog - love thrifty ideas! Linked up my shelf/picture frame/plate purchase - redo. Linked up my picture frame turned memory board. Wow, you found great things! I was there this week and last, nothing like you found...BUT come see what I found for 7 cents at CTS! Don't you just love a bargain! Wish our store had those mats and bags, what a price. I bought the treat holders for a dollar too. A little flimsy, but cute! Please enter me, and I will go check to see if I follow. I already linked up. Thanks, D...I will prob join almost every week, cause I only buy bargains! I checked, yep, I have been following! I think your Christmas Tree Shop is a whole lot neater than ours. Ours usually looks like a mess! And we sure didn't have those blue placemats with pink roses at any price or I would have snagged those! Diann, I linked up to your party #2. Diann, I linked up to your party #3. Diann, I linked up to your party #4. And I do appreciate the opportunities both to participate in Thrifty Fridays here, and to enter a great giveaway! I'd like to be entered in your giveaway. Thanks to my husband for figuring out how to get the button placed. I would love to be entered in your wonderful giveaway. I have not been doing much thrifty shopping but hope to join the party some day soon. I am a follower of your blog and love to come and visit here.